When my wife entered her first 60-day treatment center, I was told to participate in her addiction rehab family program. Reluctantly I did, but my head wasn’t in the game. I have a very stressful job, help coach my son’s soccer team and, at this time, was doing my best to keep my 16-year-old daughter out of trouble. It wasn’t easy, but we managed to get through it until my wife relapsed and entered her second treatment center. Again, I sat through their several suggested addiction rehab family programs but became resentful. Drinking wasn’t my problem – it was my wife’s, and attending these programs was taking time away from my work and life. Thankfully, a coworker came to my rescue when it was evident my life was unraveling. He invited me to attend an Al-Anon meeting. My experience with addiction rehab family programs was far from positive, but I decided to go and listen. I was shocked that some of their stories sounded just like mine. I was even more shocked that these strangers felt the same way I did. I didn’t say anything at that first meeting, but took their advice and came back the following night. I even bought the suggested literature and dove into it like I was back in college. I learned so much in that first month of Al-Anon – and learning the facts that alcoholism is a disease opened my mind and heart. Learning that the disease of alcohol is a family disease began to make sense to me. Although my wife was/is the alcoholic, my family was deeply affected by her disease. Missed soccer games, embarrassing moments, the numerous excuses we made for her behavior, our feelings of abandonment, and not being important enough for her to stop drinking were just a few ways we were affected. As I attended my meetings, I began to develop a deeper understanding of the disease and a feeling of compassion and acceptance of her illness. Without even knowing it, I began making small changes in my behavior that positively affected all relationships in my life. My family was getting healthy, and it only got better when my kids began to attend Ala-Teen, which is a fellowship designed for teens whose lives have been affected by someone else’s drinking. 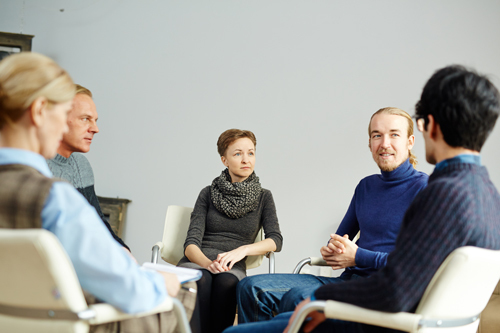 Most, if not all, addiction rehab family programs are based on Al-Anon. I was just too closed minded to see it – but when I did, my life changed. To learn more about treatment programs at Twin Lakes drug rehabilitation centers in Atlanta GA, please contact us today at (877) 958-0778.